Get the Viral Marketing Toolkit! It is out! 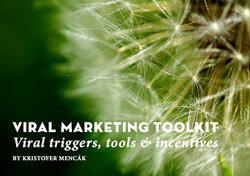 My expanded and updated version of the Viral Marketing Toolkit! Have you ever dreamt about creating something viral? In this ebook you will learn viral triggers, tools and incentives to maximize the potential for viral spread of your content. It is based on distilled research and more than 10 years of practical experience within digital marketing and strategy.